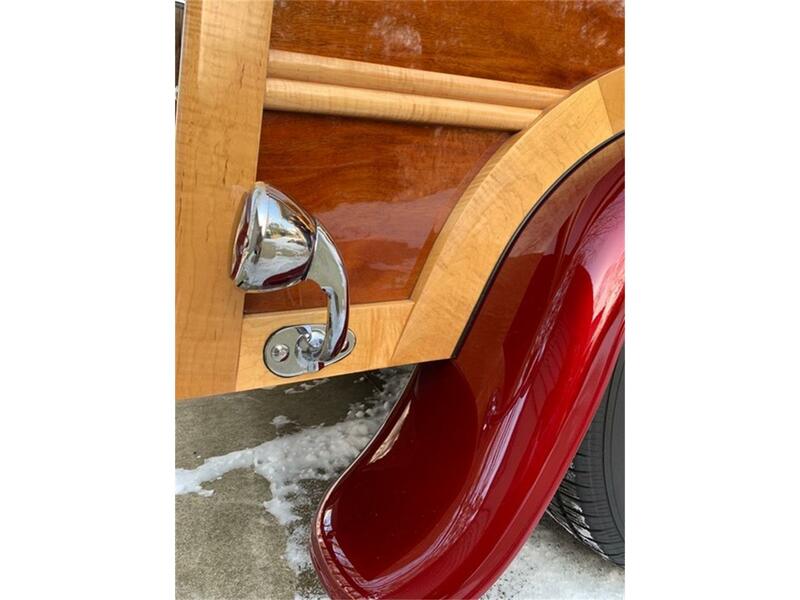 I have restored several 60’s vintage muscle cars but began to tire of rust so being a big fan of the classic mahogany boats my wife encouraged me to build a woody automobile. 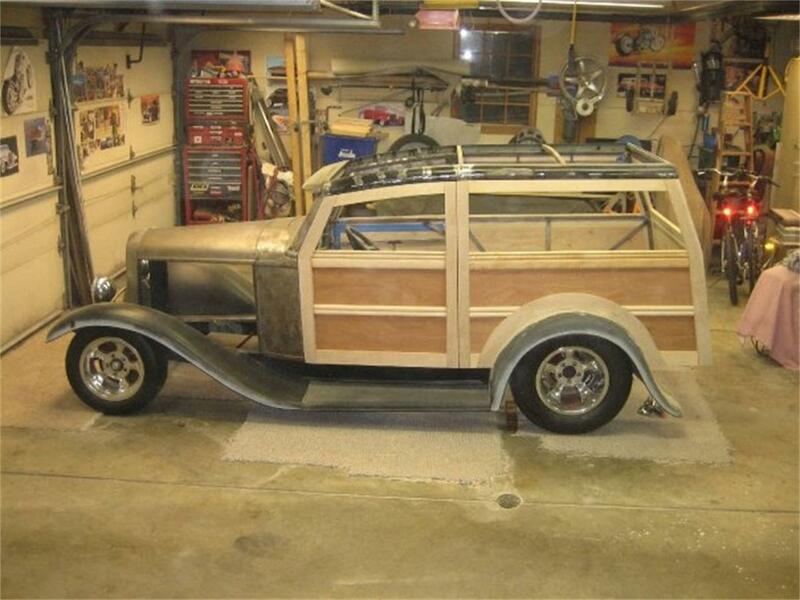 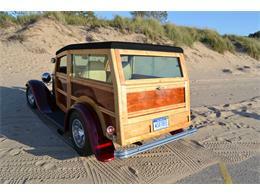 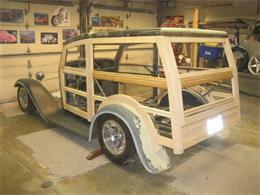 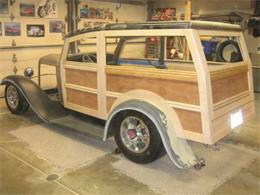 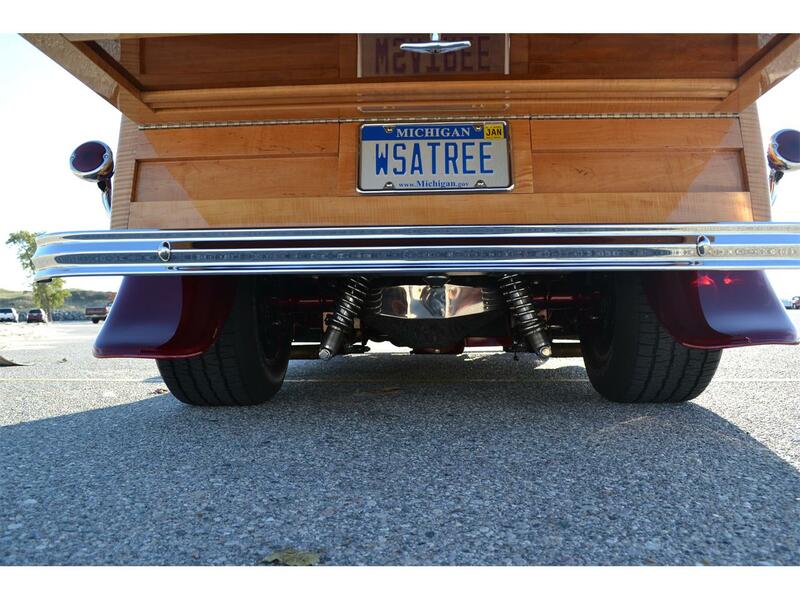 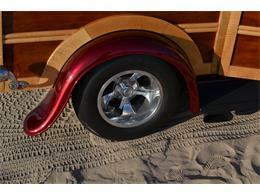 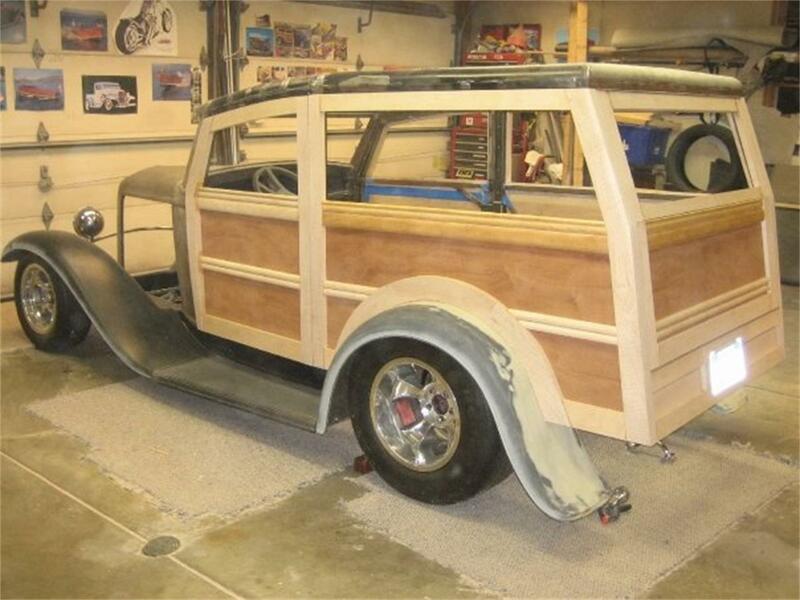 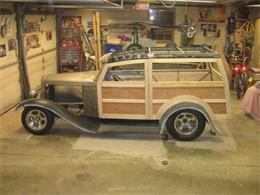 Her idea was a classic woody but my idea was a 32 Ford phantom woody, I prevailed. So here is my dream rendition of a 32 Ford woody wagon, which took well over 10 years to complete. 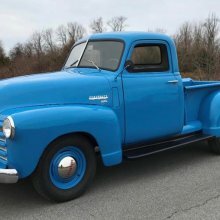 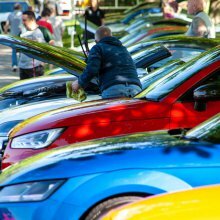 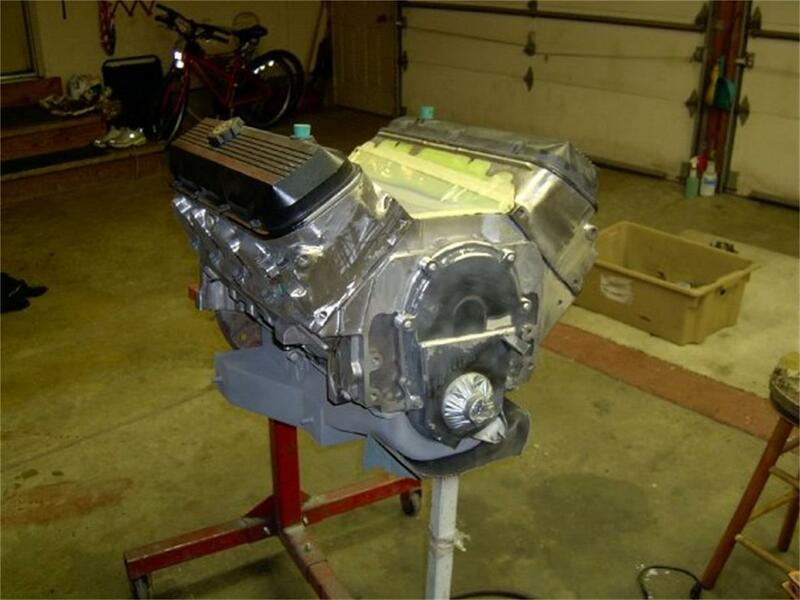 I began training to be an auto body technician but soon felt the dangerous chemicals would not be conducive for long life so I joined the Air Force and uncle Sam assisted me with college expenses in the electronics trade, restoring and creating high quality cars became a lifelong hobby. 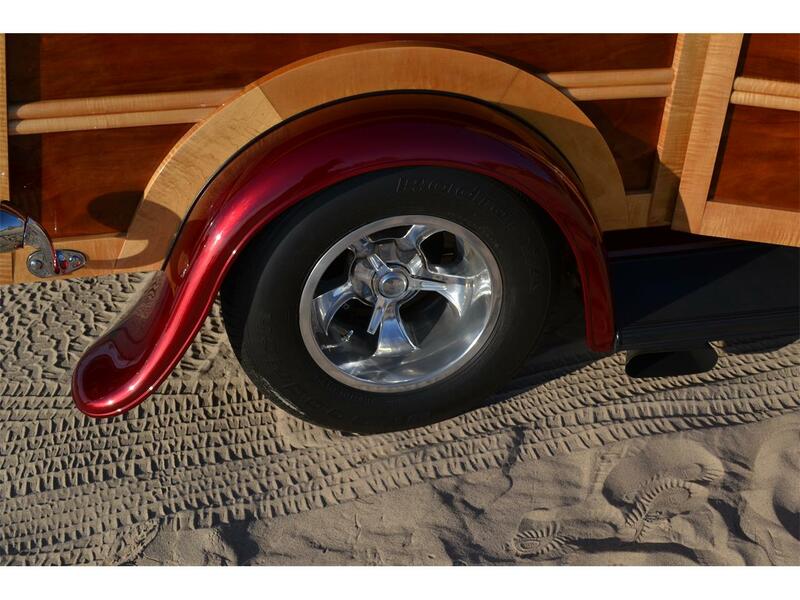 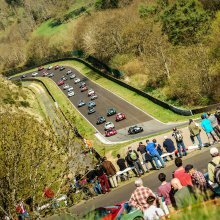 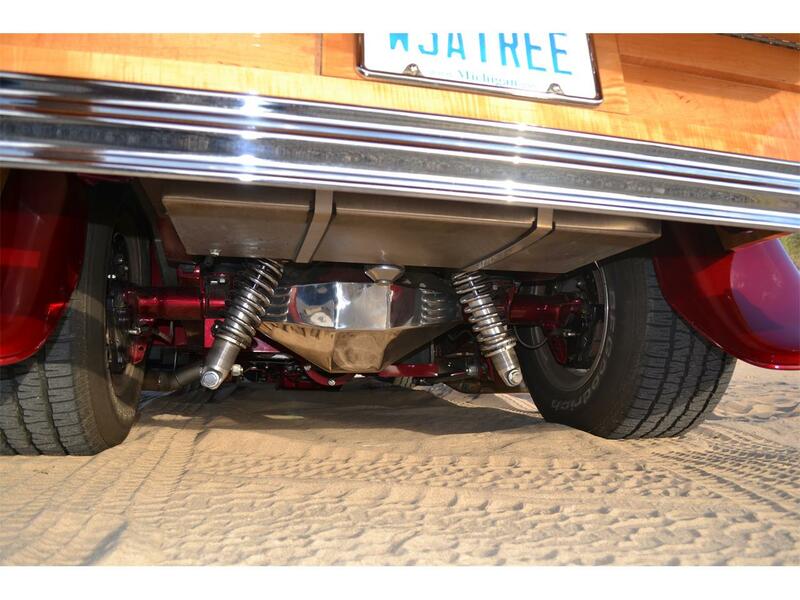 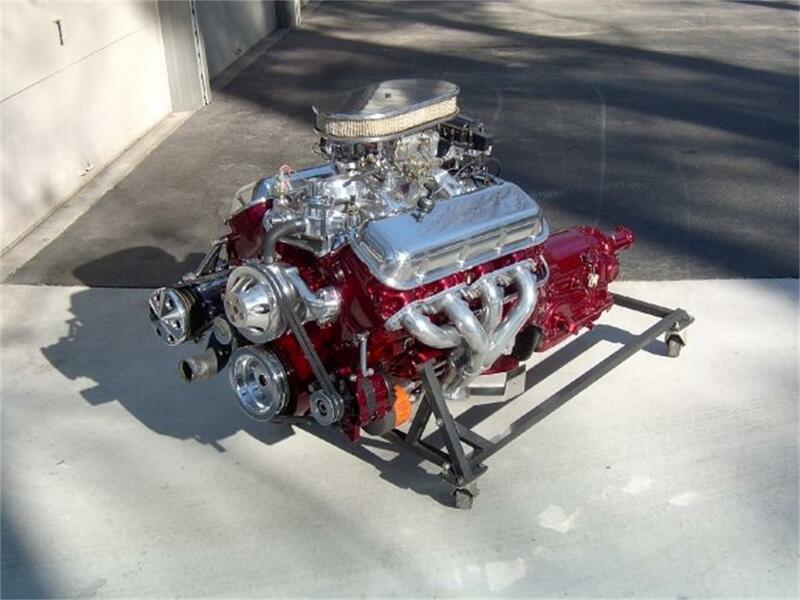 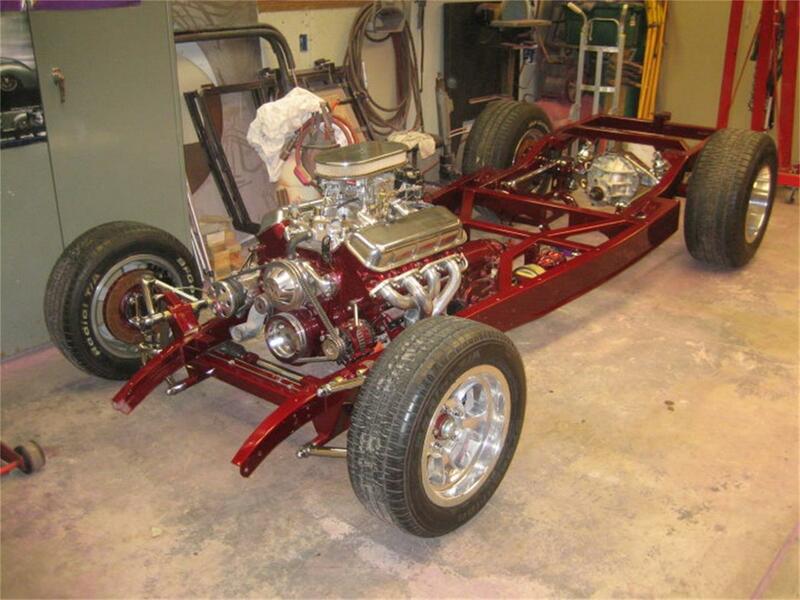 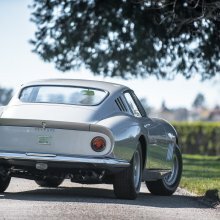 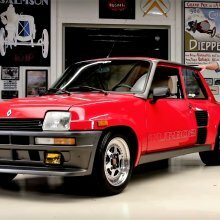 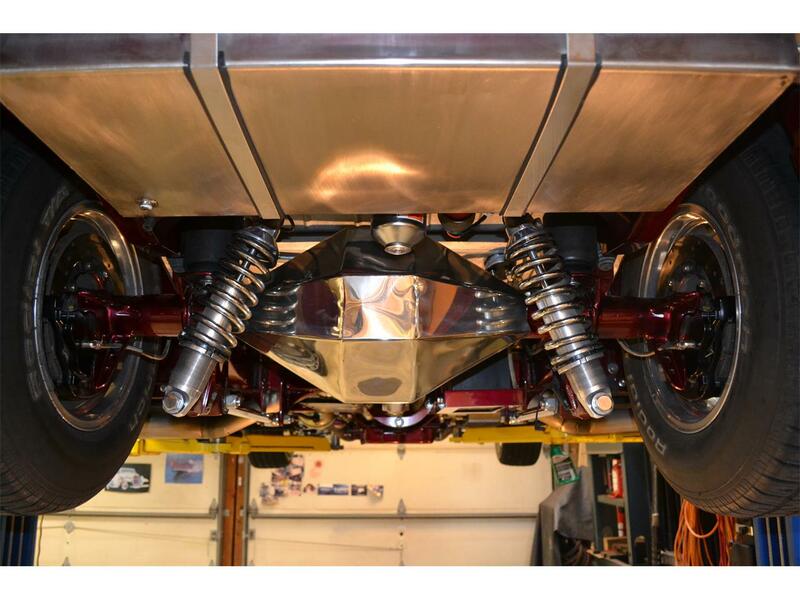 I designed everything myself with only the frame and suspension left to the professionals at TCI to provide a square structure to build the body from. 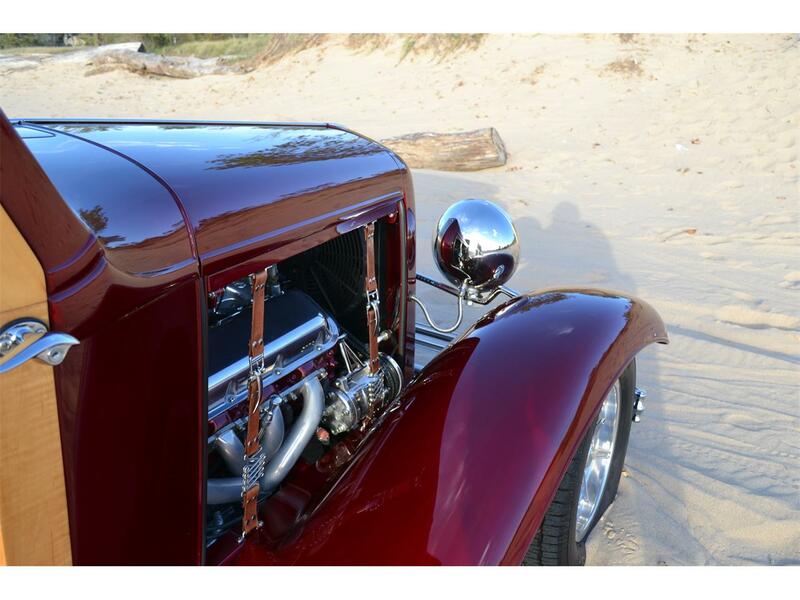 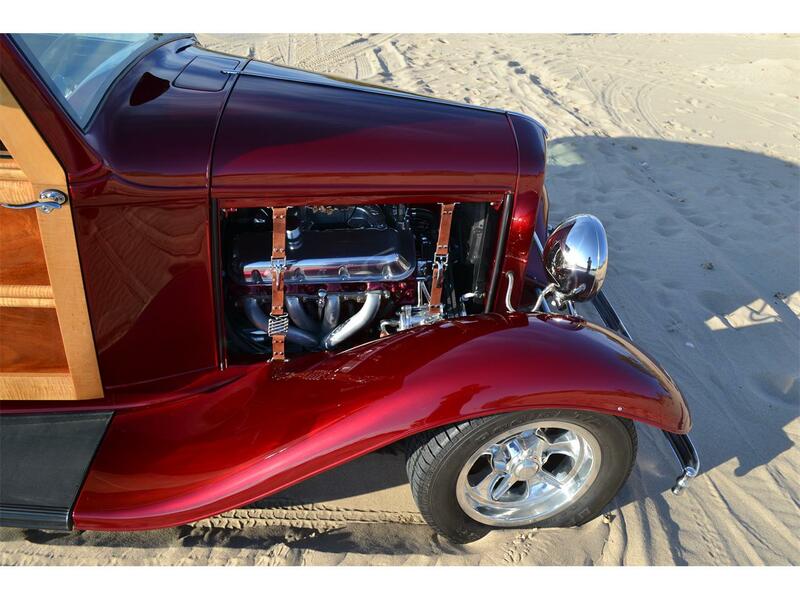 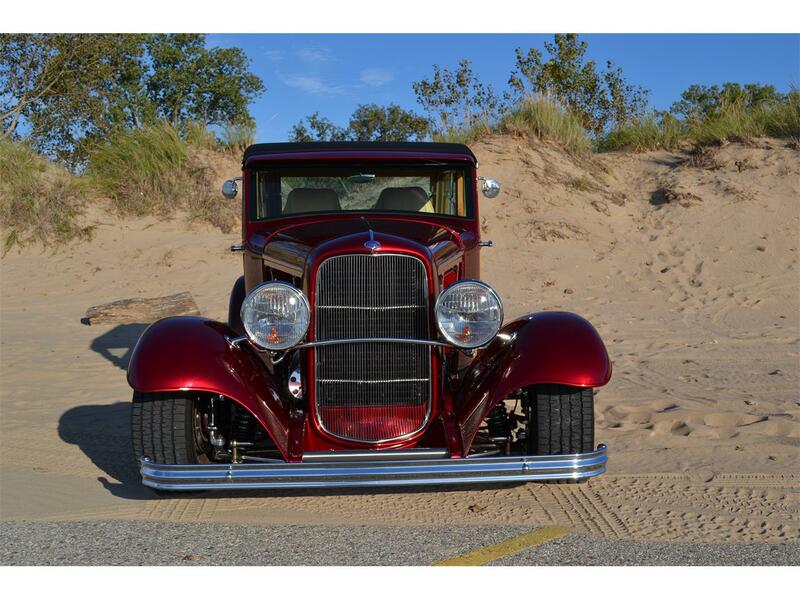 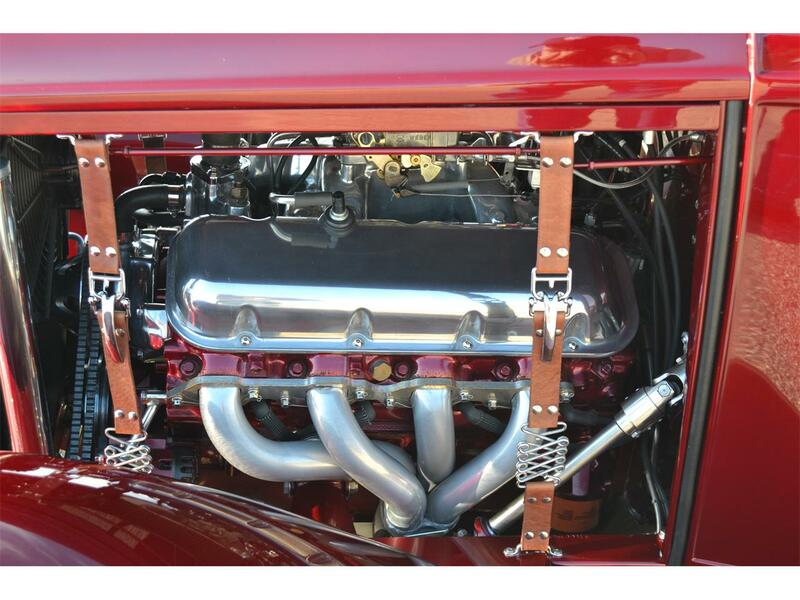 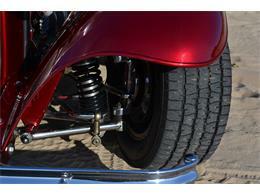 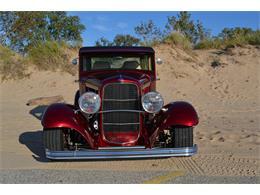 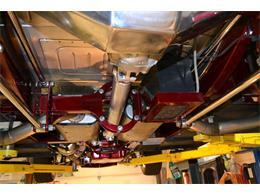 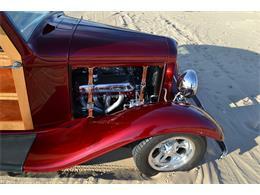 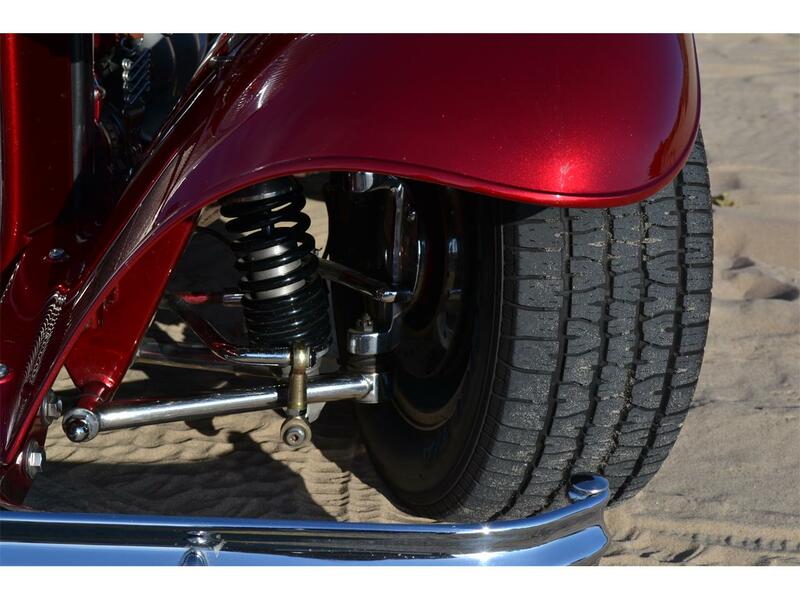 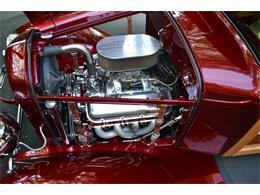 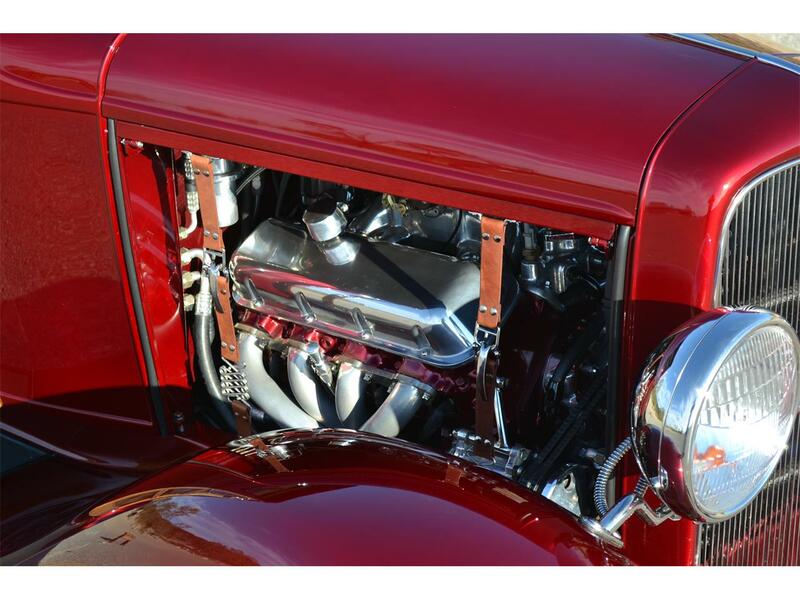 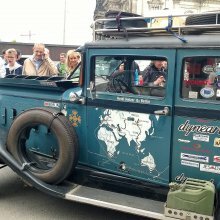 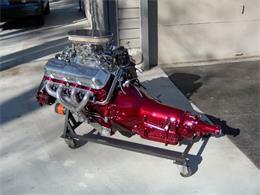 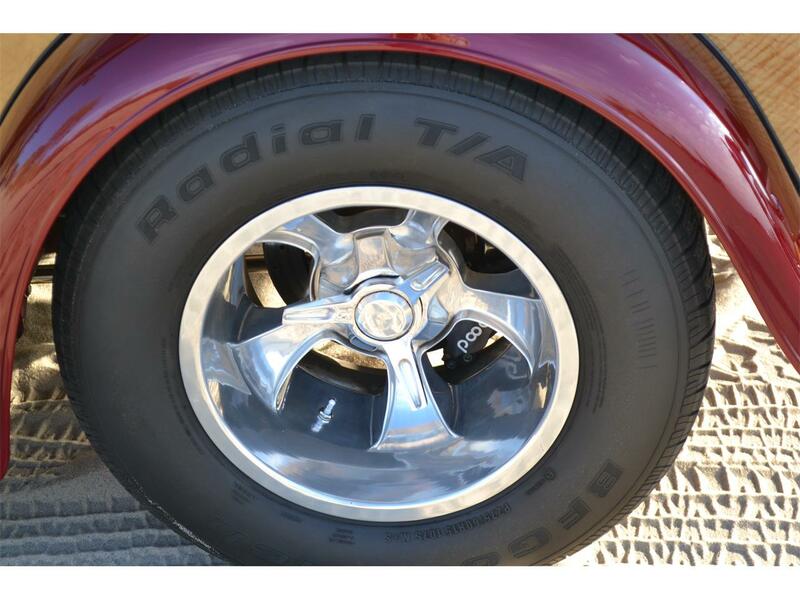 The car started life as an original all steel 1932 Ford pickup. I chopped the top 2” keeping the original visor and then tilting the window frame rearward for a streamlined effect. 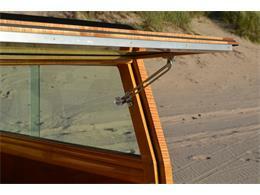 The original cowl vent was kept and I used an electric window regulator to power it open and closed. 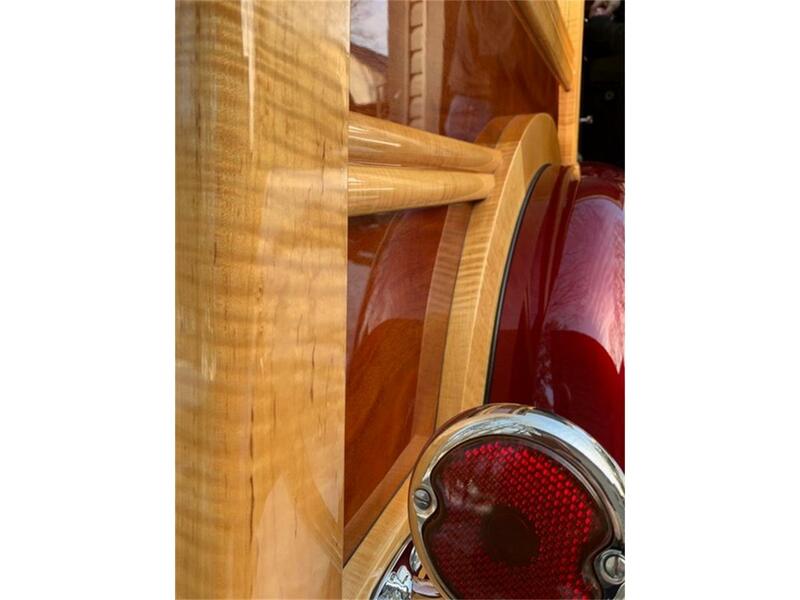 The entire body is steel and wood, no fiberglass.The paint is House of Kolors kandy brandywine which required many steps, 3 coats of base color then 5 coats of Kandy followed with 3 coats of urethane clear sanded and polished to perfection. Everything was custom built one off from the stainless steel baffled fuel tank to the woodwork which is entirely built over a steel frame structure including the suicide doors. 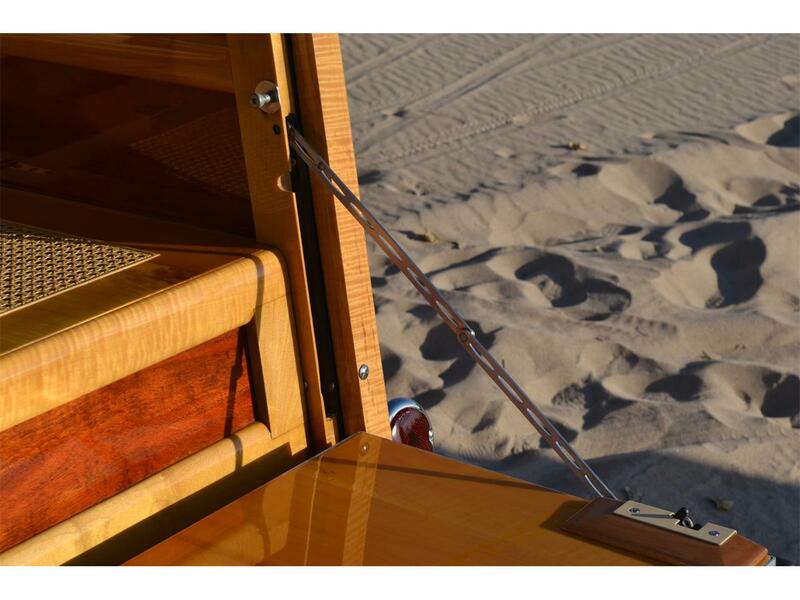 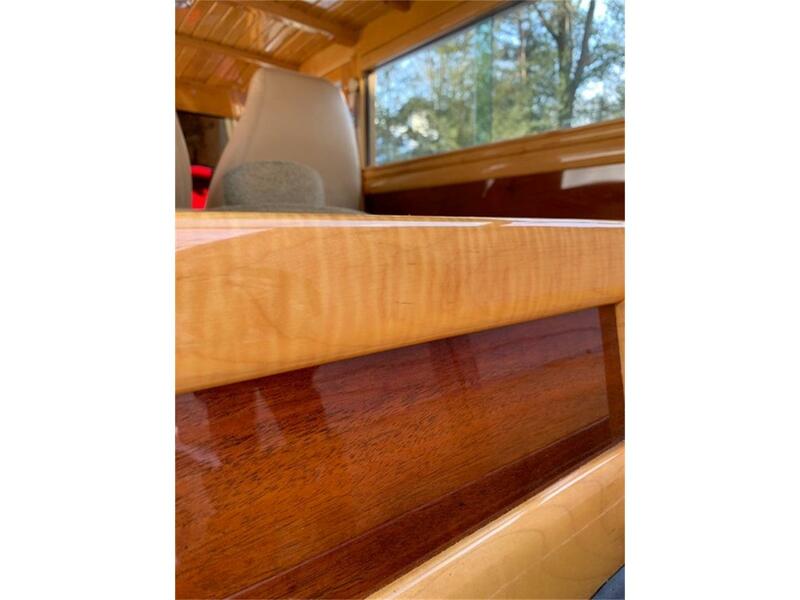 The woodwork was created from highly figured curly maple frames and African mahogany panel inserts completely encapsulated inside and out with WEST 207/105 epoxy and then coated with Imron 500s polyurethane for UV protection, the wood is extraordinary and must be seen. 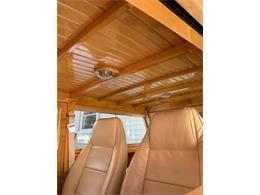 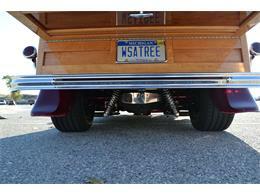 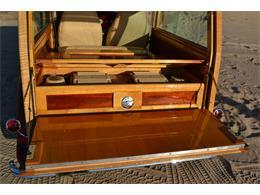 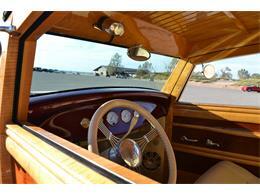 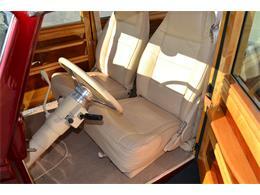 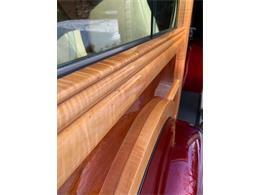 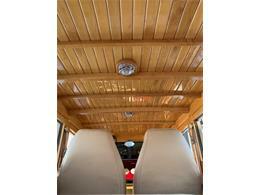 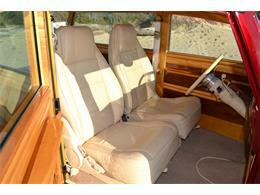 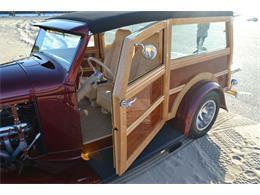 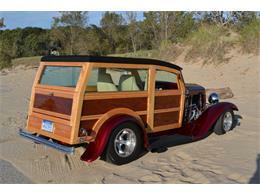 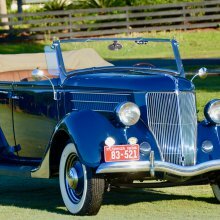 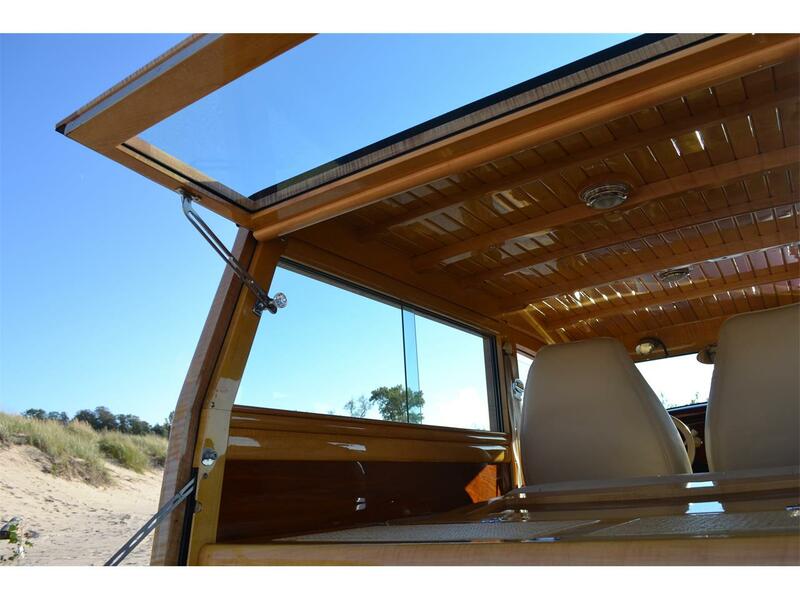 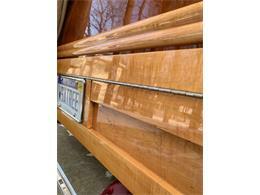 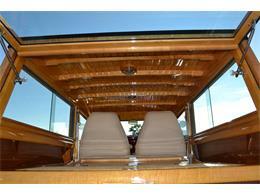 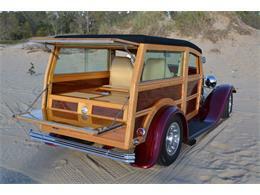 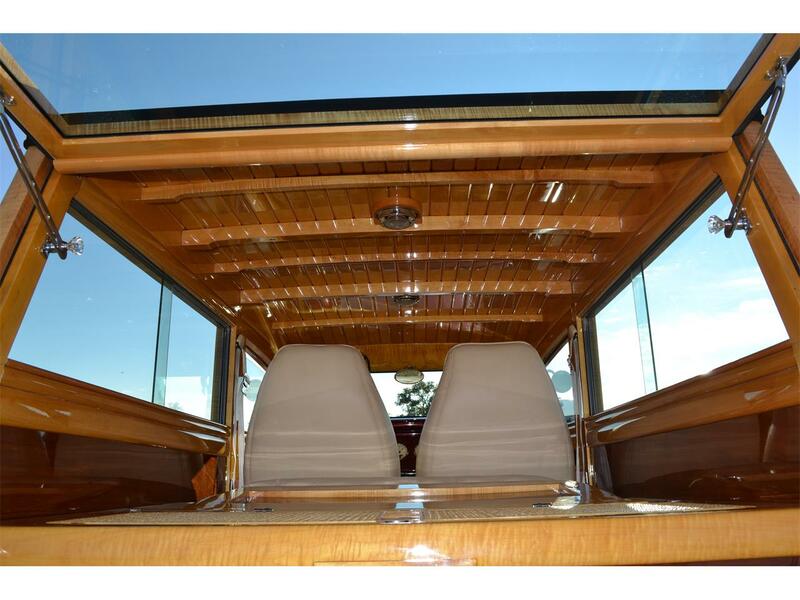 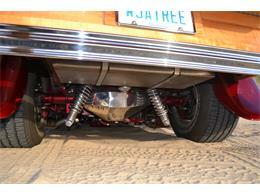 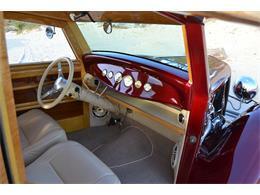 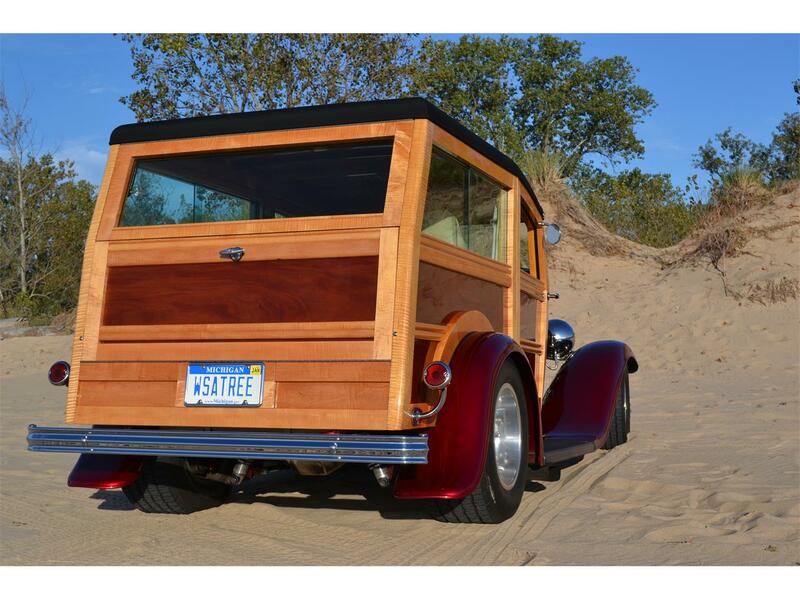 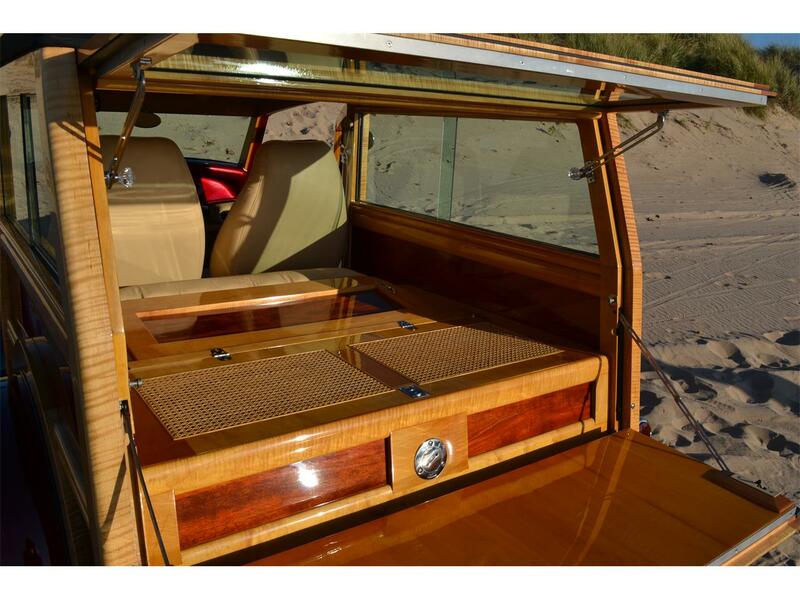 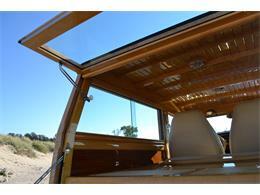 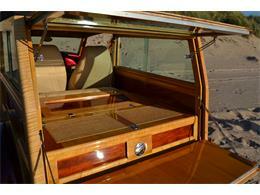 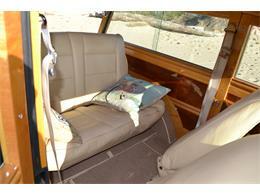 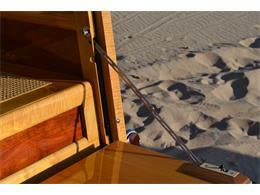 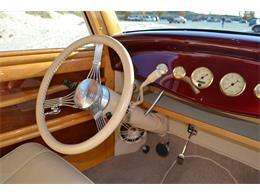 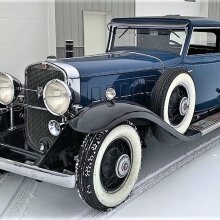 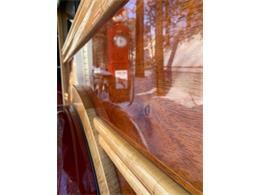 This car was built like a boat for all weather resilience which is nontypical to woody cars hence their extreme rarity. 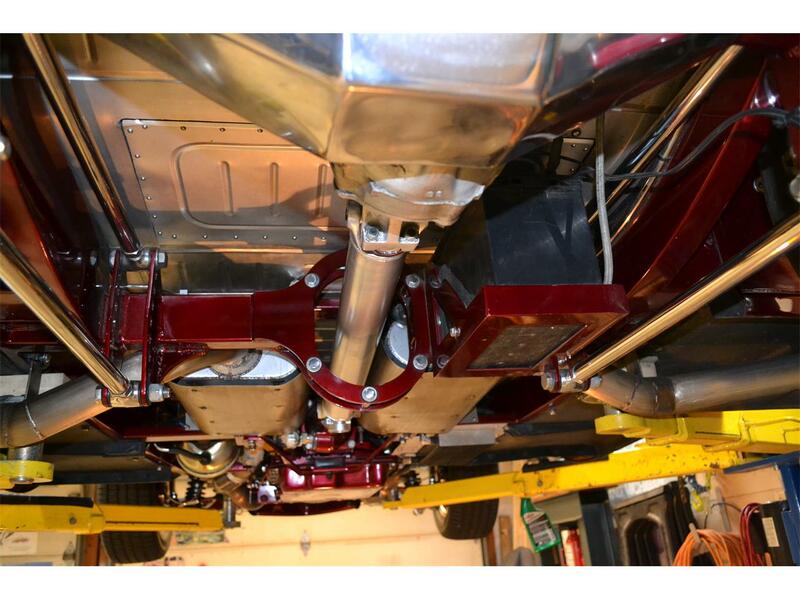 The normal spaghetti wiring with wire splices everywhere will not be found in this car, electrical wiring and harnessing was done to OEM standards. 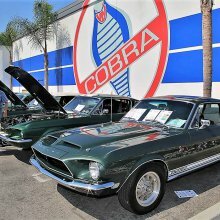 I made a CAD drawing of all the electrical systems and used Weatherpack connectors everywhere for reliability. 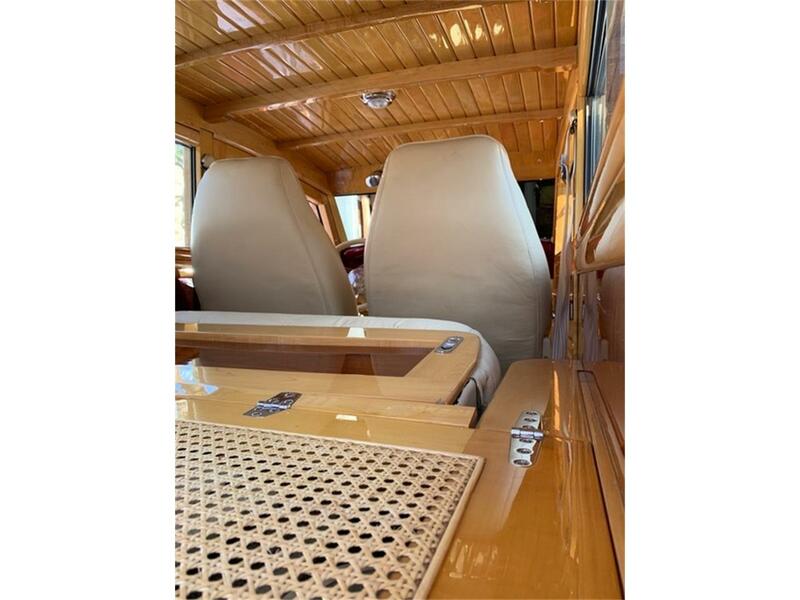 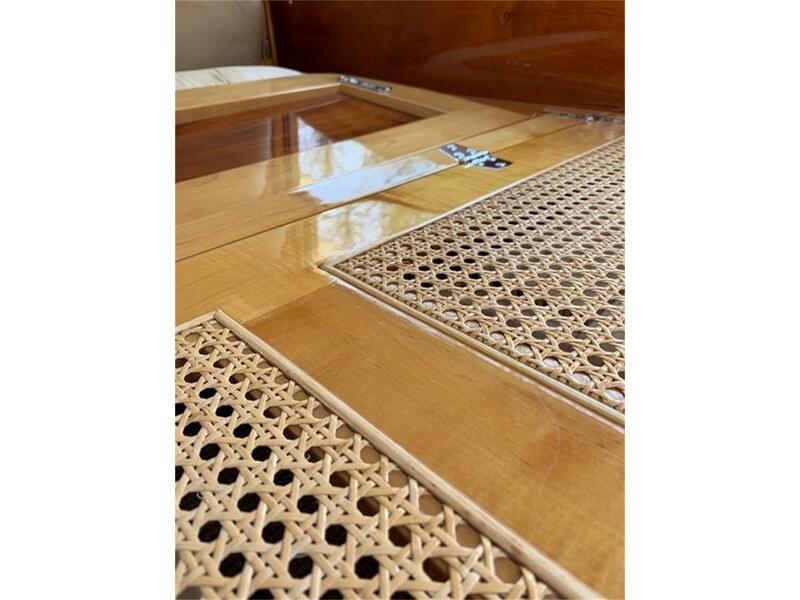 The interior has Dynamat thermal/acoustic insulation with the floor covered with German square weave wool carpet. 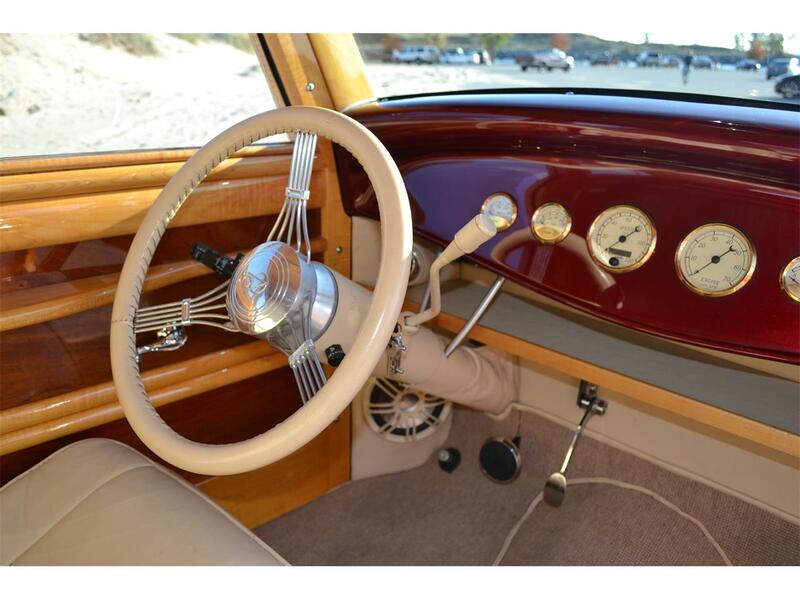 I kept the beautiful 32’ dash completely unfettered with gadgets by putting all the switches and controls hidden under the dash. 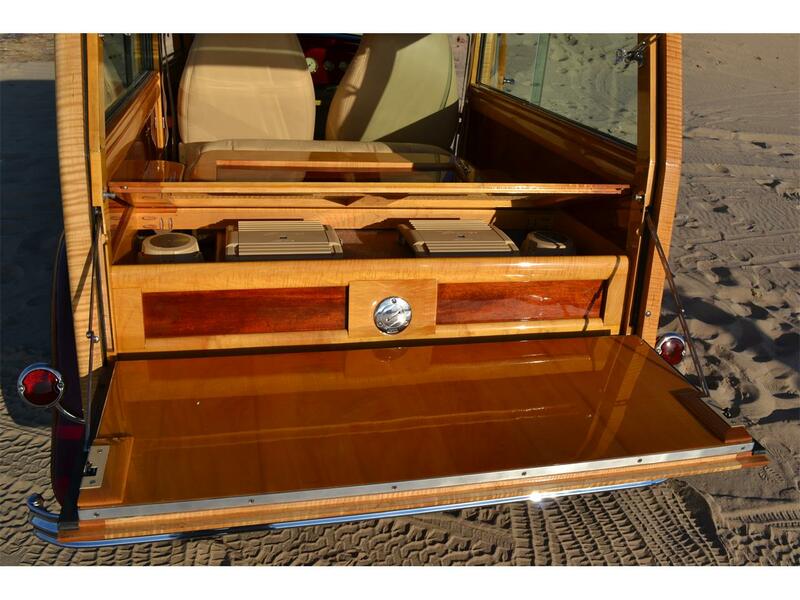 To maintain the clean dash I used a Bluetooth interface to connect your phone or tablet directly to the two amplifiers, one for the mid-range and tweeters and the other amp exclusively for the two 10” sub-woofers under the beautifully caned rear deck. 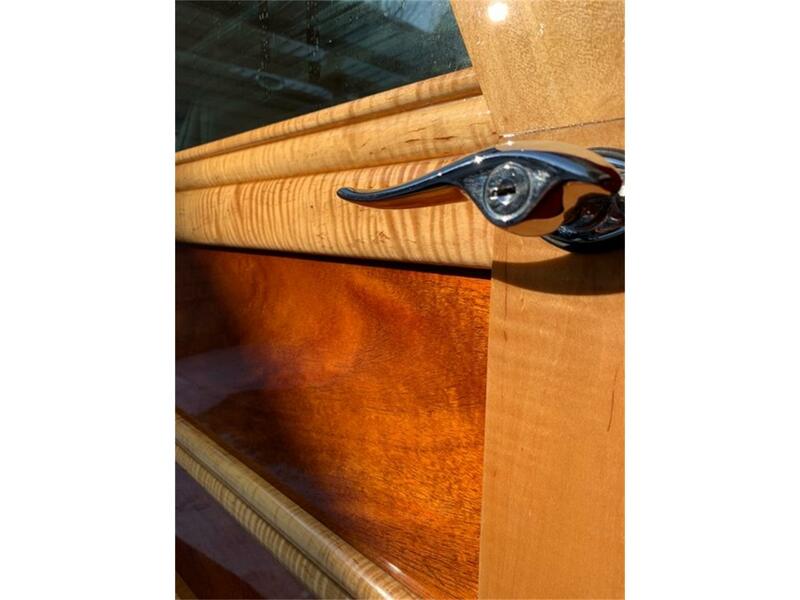 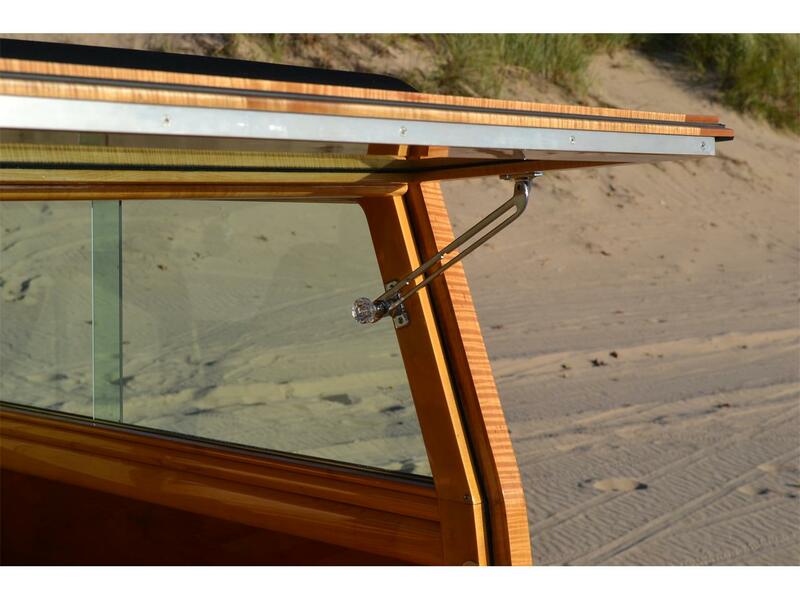 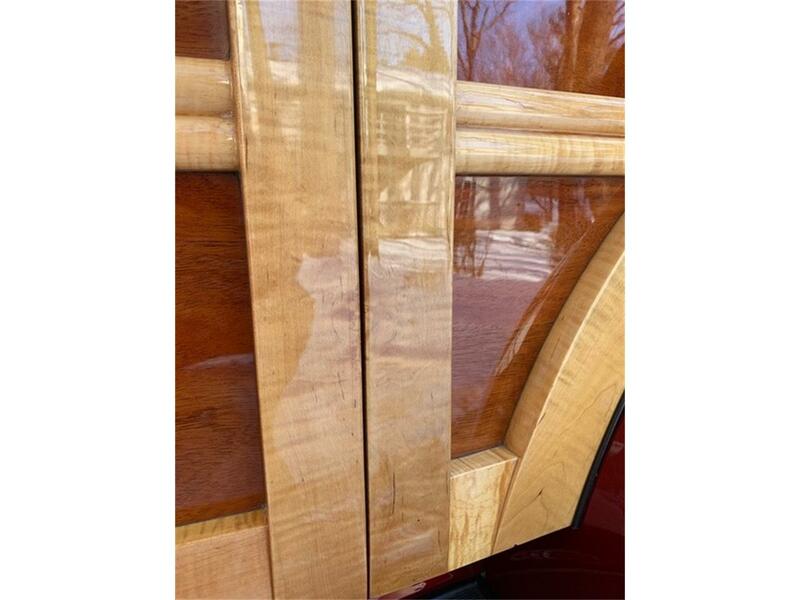 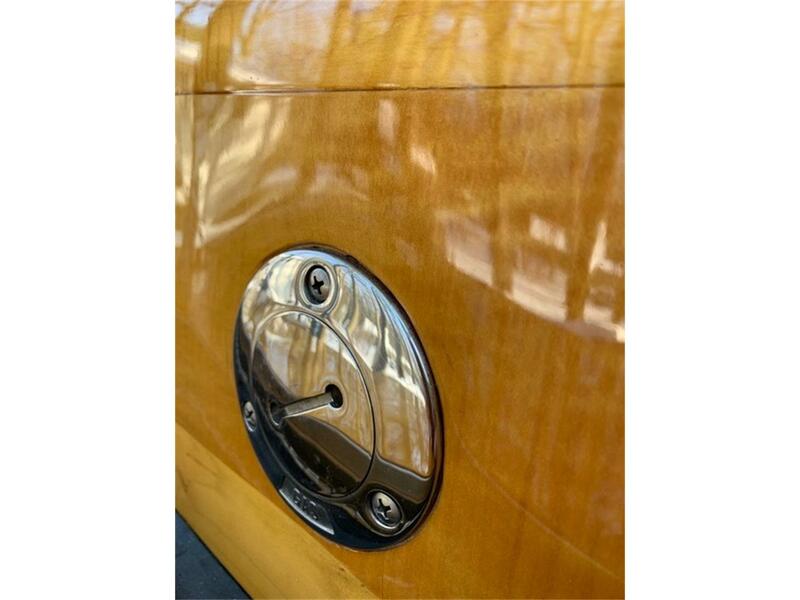 Power windows are also hidden within the woodwork of the doors with the original window cranks used as up/down switches giving it the original vintage style. 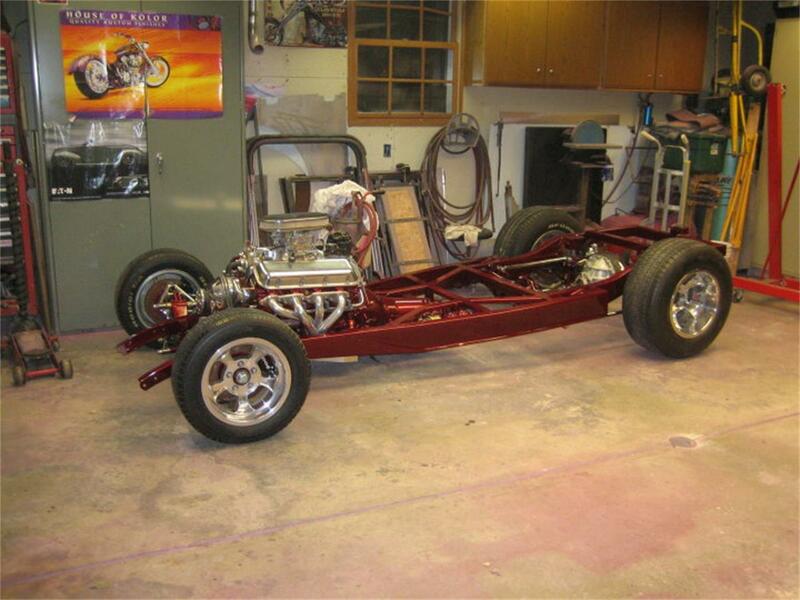 As can be seen in the construction phase I started with fiberglass fenders but bagged them later for all steel stamping's from Brookville Roadster. 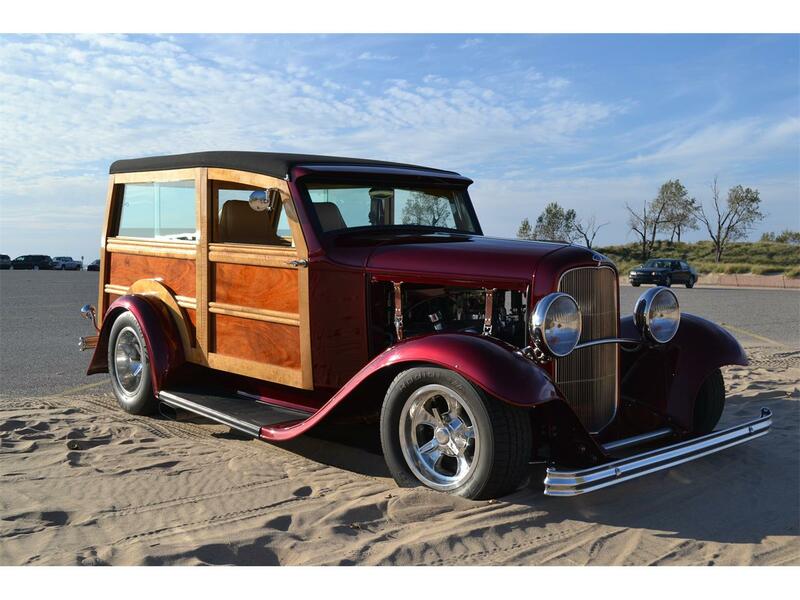 This is one of the most beautiful woodies I’ve ever seen but I’m subjective so feel free to look through the photos and see if you agree. 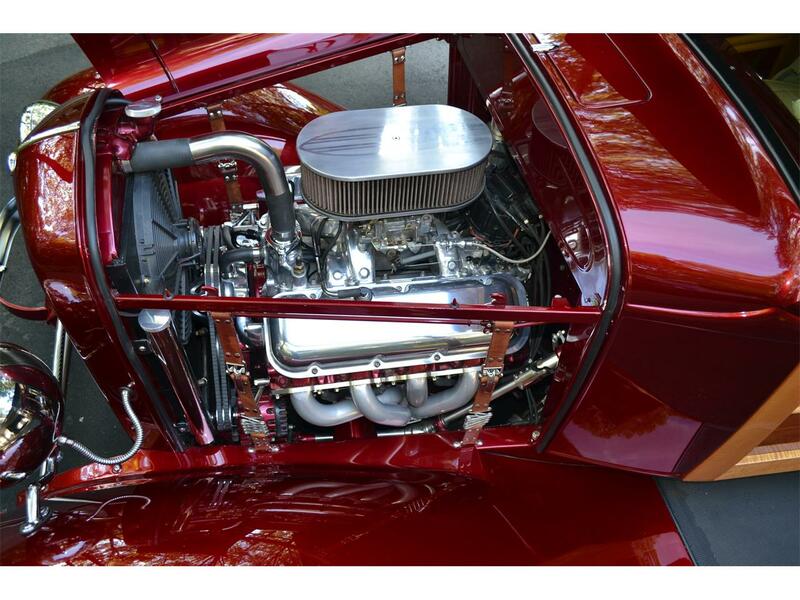 I’m asking $79,500 for this car which you will see by the craftsmanship is way below the cost that has been invested without even considering the well over 8,000 man hours. 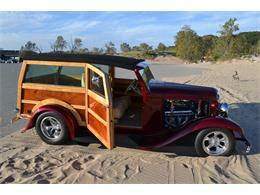 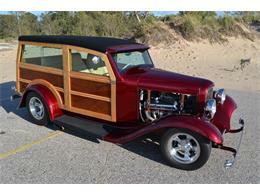 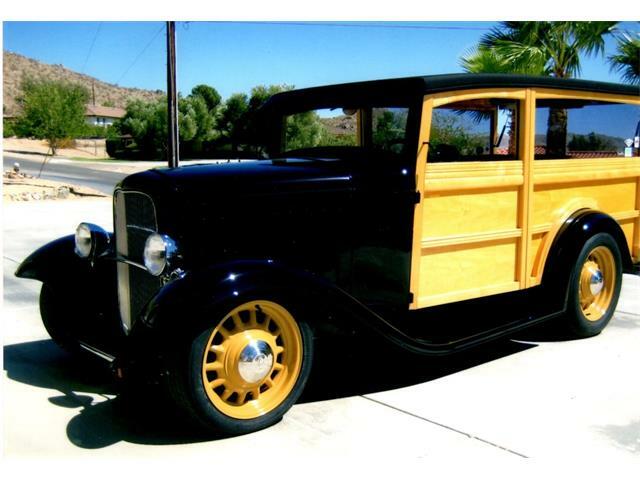 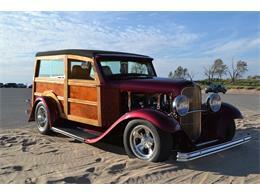 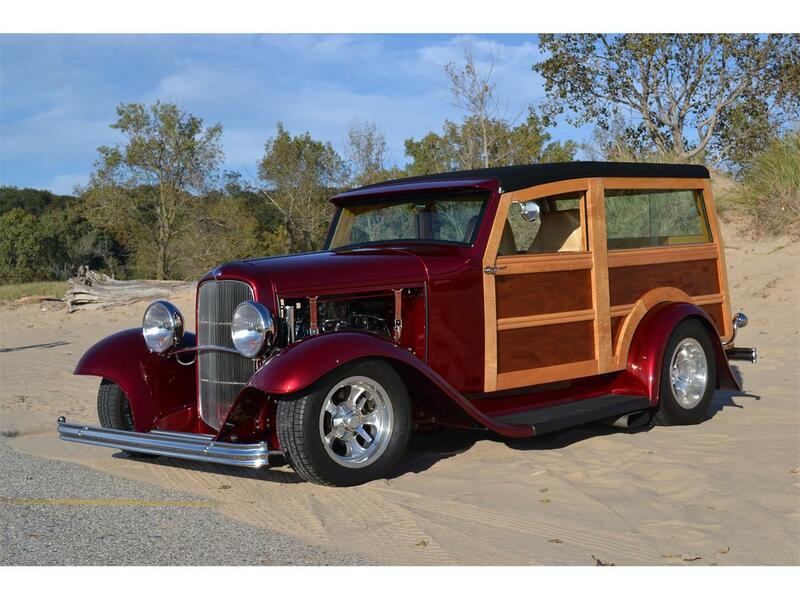 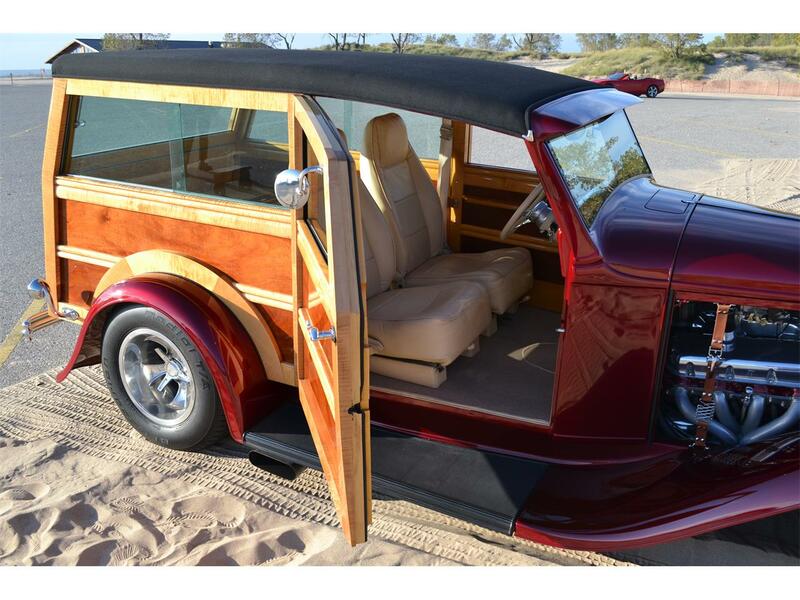 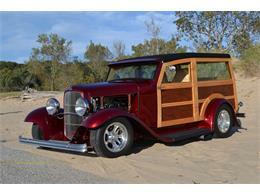 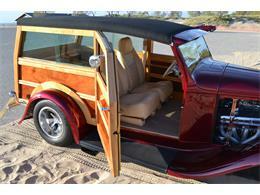 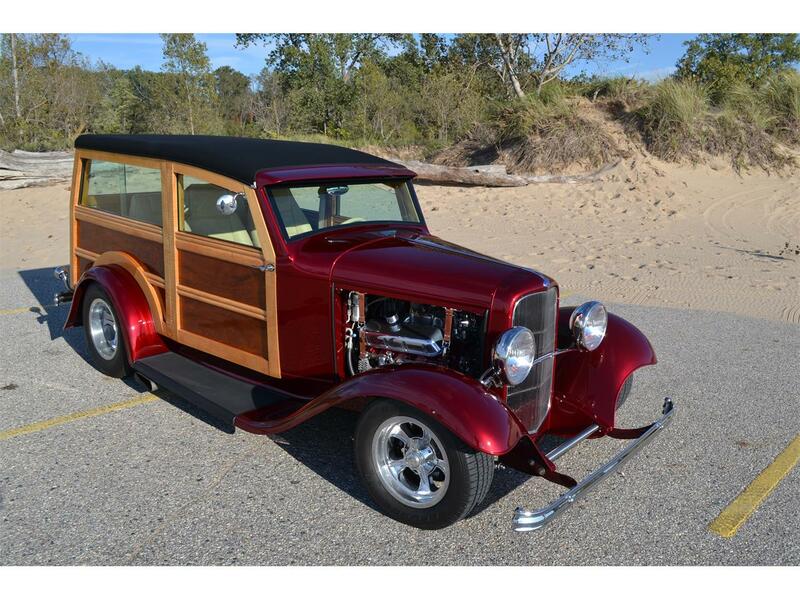 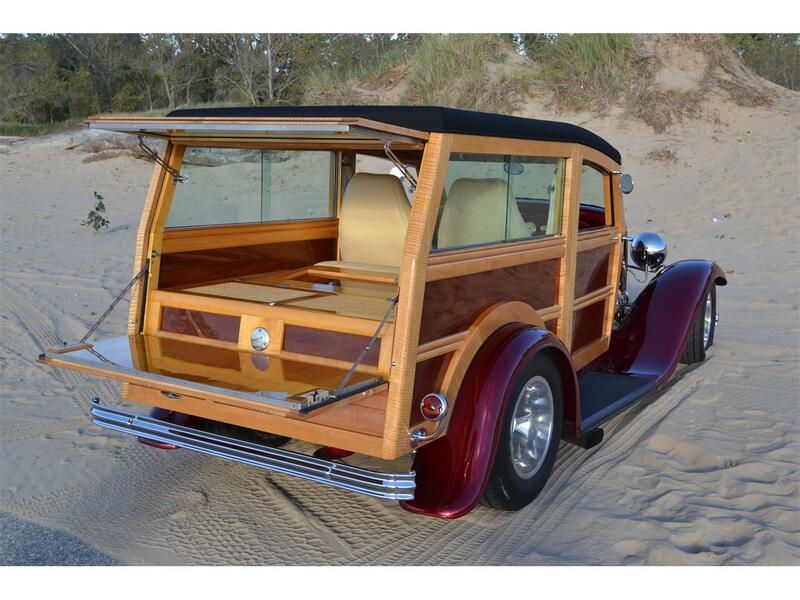 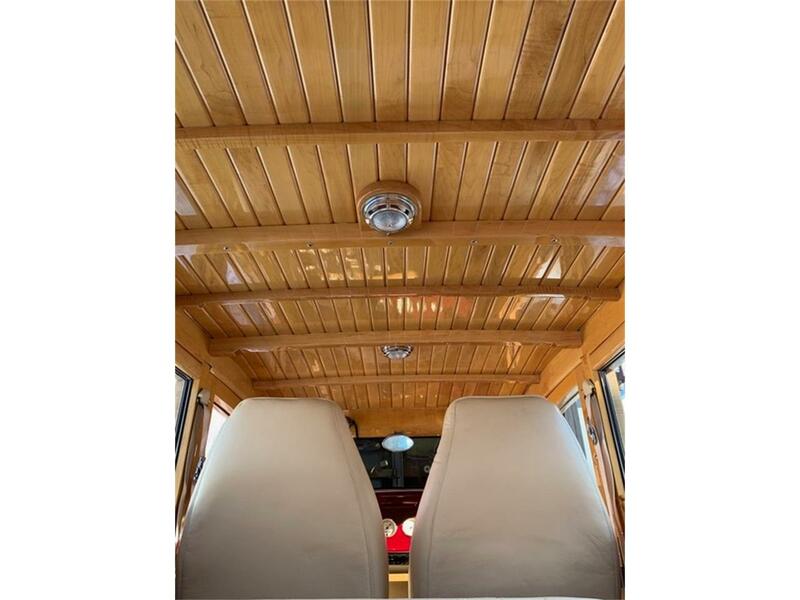 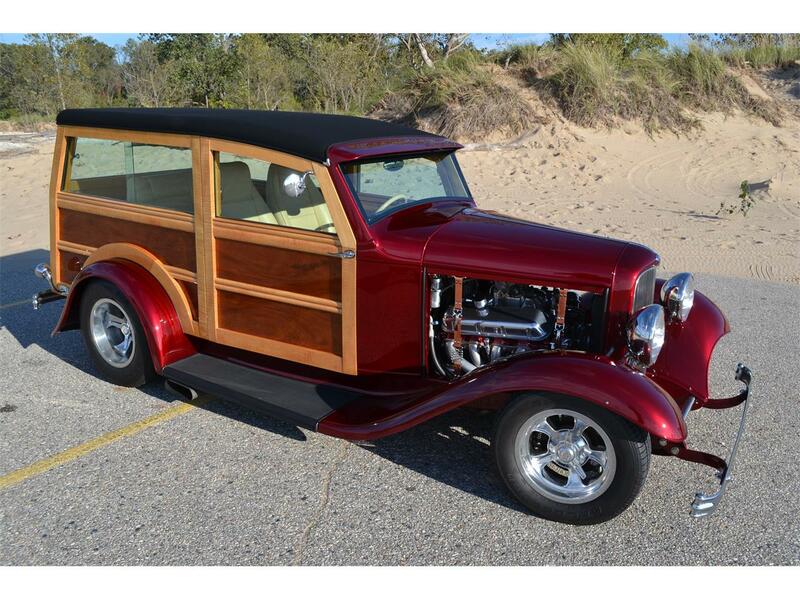 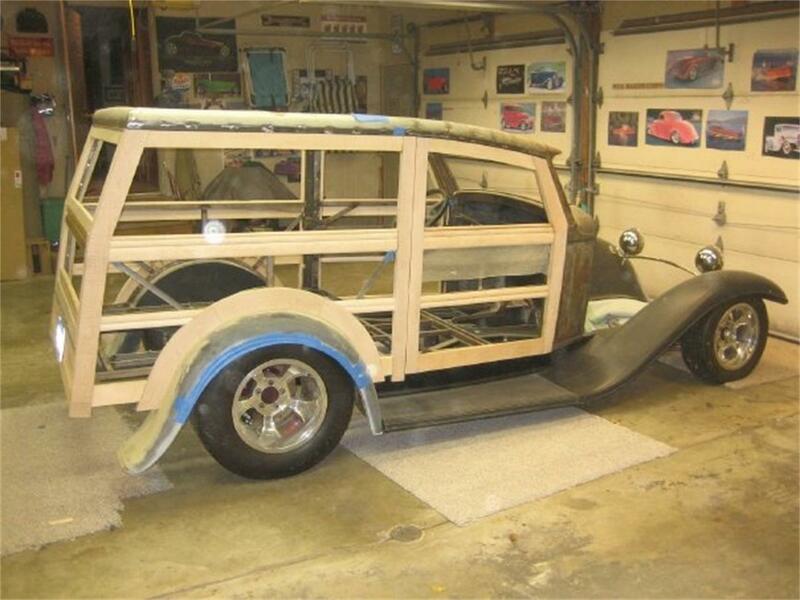 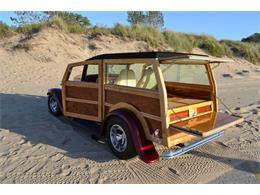 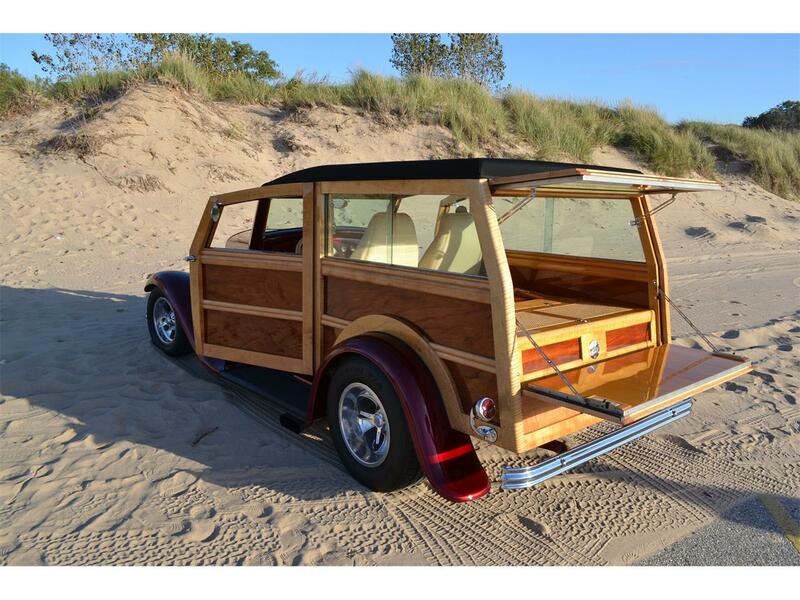 Hi, I'm interested in your 1932 Ford Woody Wagon listed for sale on ClassicCars.com for $79,500.00.